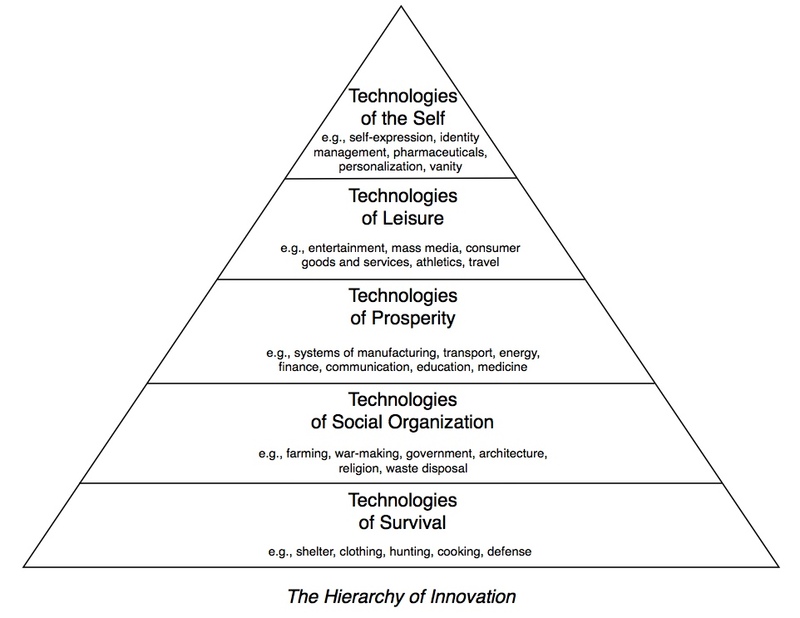 Three years ago, I posted a piece here titled “The Hierarchy of Innovation,” which argued, speculatively, that the focus of innovation has followed Abraham Maslow’s hierarchy of needs, beginning with Technologies of Survival and now concentrating on Technologies of the Self. With The Glass Cage done, I’ve decided to return to this idea with hopes of fleshing it out. I’m republishing my original post below and am soliciting your comments about it. Thanks. This entry was posted in Uncategorized on January 20, 2015 by Nick. Nonsense. You weren’t really thinking when you tacked that one on. It sounded like “Wow, that’s writing!” let it stand. Cheap zinger though it is. You can do better. I think you need to consider the declining influence of the federal government as an engine for innovation. Between the end of the Cold War and the rise of neoliberal politics, the US has lost its most significant historical force for grand scientific and infrastructural projects. We expect very little of our government now, and turn our attention instead to the limited scope of what startups and entrepreneurs can accomplish with venture capital. You say, “An entrepreneur has a greater prospect of fame and riches if he creates, say, a popular social-networking tool than if he creates a faster, more efficient system for mass transit.” The fact is that an entrepreneur is not in a position to implement an improved mass transit system without the cooperation of government. Free-market absolutism restricts the gamut of potential innovation to things that are profitable either for large, entrenched, monopolistic companies or for scampish startups. Lots of things don’t fall into either category because they are too large for the startup, and not profitable enough for the behemoth. This is precisely the domain “big government” used to occupy. The reason “we” as a society don’t innovate on a higher level is that we’ve crippled the only institution powerful enough to get this sort of thing done. Perhaps if there were a resurgence of leftism in the U.S. and a call for government to return to its prior influence, we might then see more ambitious technological projects and inventions for the common good. I agree that life altering innovation has slowed to a trickle. But I don’t think it is the individuals to blame. All of the industries that can alter life are wayyyyy to big for an entrepreneur to penetrate. Kanye West is a great example of this. A year ago he was screaming about how he was a slave. The reason for this is he realized why he couldn’t become the fashion mogul he dreamed of. His words describing why were, “They got factories”. The big names are too big, their processes of manufacture too efficient for a start up to match. So, we accept these Apple, Google, Home Depot, as our overlords as we cling on to the things we are still able to change. I want to like this thesis, and there’s a lot to think about here. The word “technology” has become filled with subtext, I liked how you used the word “tools” instead. I do have one concern – many of these tools are parts of multiple (or all) categories. The Chef’s Knife is both a tool of survival (cooking at home), a tool of leisure (eating out), and a tool of prosperity (the butcher shop). Facebook is both a tool of the self and of social organization (and probably fits into other levels, depending on the use). The Automobile is a tool that seems to fit into all categories. Each innovation certainly has a specific focus, but just as much innovation happens in finding new uses for a specific tool in other areas. We use our creativity to not simply invent new tools, but to invent (or rediscover) uses for existing tools. On the note of “decadence”. There is an irony here. It doesn’t seem that an emphasis upon ” more powerful tools for modifying our internal state or projecting that state outward” should necessarily be one that ends in decadence, but it actually does. It seems that emphasis upon “expression” or “projection” is at an inverse of “having something to express”; ideas seem to need time to gestate, and a constant need for expression and a facilitation thereof leads to personal shallowness, not depth. The desire to “modify” our internal state seems to suffer from a sort of opposite desire- -to shape ourselves in terms of some external goal. But this also seems to lead to a kind of shallowness; we have nothing, as it were, of our own, but are merely the function of the various projects we make of ourselves. Facilitating this seems shallow and decadent as well. It seems that to have a self worth having is to avoid, that is, both easy expression and modification. So I’m not sure, I guess, as to whether we really are in the age of technology of the self. @zoe – I’m confused as to where you think the federal government has been a positive for innovation? The only conceivable place where I could see some argument to be made would be in the NASA Space Program (though there, the government provided the $ and goals, and contracted most of the work to private engineers). In fact, one can make the historical case that it was those countries that involved themselves the *least* which saw the new technologies become adopted the most. Pre-WWI Austria & the Ottomans are prime examples of governments that stifled innovation. As for the “free market” restricting inventions for the “common good”… please define an tool that humans use that was created with the intended use being the “common good”. The “Free Market” isn’t a real thing. There are just people transacting with others, inventing tools which will *help* their customers. Yes, but I would argue that this supports my argument – that it’s a symptom of the shift in the focus of innovation in society. Maps? Ports? Postal system? Greenwich Mean Time? Rural telephone and electricity networks? Hydroelectric dams? Interstate highway system? GPS? The Internet? In response to Nick: I see how you connect it to the idea of a broader societal shift. To clarify, I suppose I am taking a more cynical view that this shift has been escalated by the rich and powerful, rather than from a grassroots, “democratic” change in cultural priorities. However, I could certainly see how the public’s fatigue, apathy or frustration with the system leads us to retreat to more self-oriented distraction. In that sense we are complicit with the way things have changed, but I know plenty of people who wish we could hold government to a higher standard, but feel powerless to do so. Isn’t all the identity obsession, narcissism, self-expression exactly what Thiel blames the hippies for? Gate’s biography also complicates the story since it suggests a counter-narrative. Yes, in many situations, as you say, “The more comfortable you are, the more time you spend thinking about yourself.” But for Gates that might not actually be true. Instead of spending his retirement years developing “technologies of the self” he’s become more civic, more interested in the welfare of others, and more interested in developing medical infrastructures that cater to lower order needs. The capitalists are on strike! There will be no innovation until John Galt is unfettered by the state! I’m with Nick – if only we could put Theodore Vail’s brain into Mark Facebook’s head, social networking would be as it should be: a regulated monopoly with a guaranteed rate of return, and an incentive to massively fund R&D – picture Zuckerberg’s “Like Labs” in Orlando, Florida. Either you’re on the right track, which would be depressing to say the least, or you’re way wide of the mark. If the latter then what accounts for your (and like-minded pundits like Fox) alleged slowdown in innovation? There is another way to look at innovation, a way that qualifies innovation neither as “decadent” nor as a form of virtue (though undoubtedly many innovations are virtuous.) We could look at innovations pragmatically, as answers to problems. Generally speaking the bigger the problem the higher its priority, the more effort and resources are given to finding a solution. Go back in time to our ‘foundational innovations’, fire and weapons, which solved our biggest problem, survival. Without them all subsequent innovations would not have happened. Fire and weapons were followed by innovations like fortified settlements (because fire and weapons are not purely virtuous), cultivation, animal husbandry, writing… The subsequent centuries witnessed the ebb and flow of innovation in sync with the necessary social conditions to address them. The social conditions of 17th and 18th century Europe, to cite one of your favoured examples, like increasing urbanization and international commerce, required innovation to solve problems in energy generation, transportation and manufacturing. The latter 19th and most of the 20th centuries continued those trends because increasing urbanization and internationalism also continued, hence the emphasis on systems innovation: highways, electronic communications, and agribusiness among many example. If, here in the early 21st century, we seem to be in an innovation ebb it’s because the 20th century’s systems problems, which most of us grew up with, have been mostly solved (for better or worse) and therefore innovation is focused in areas that are relatively inaccessible, if not invisible, to the typical systems consumer. The list of recent and upcoming innovations is lengthy and beyond my knowledge to exhaust but includes developments in nanotechnology, quantum computing, robotics, AI, physics, cellular biology and much more. The challenge is to communicate these innovations to consumers caught up in trivial disappointments about their upgraded iPhone or barely discernible difference between 1080p and 4K TV. Innovation continues apace, just not where it’s hyped to be happening. This is one way of looking at it, but always in the sense : “innovation is packing up things since the industrial revolution”, and the associated energy to run this innovation is a given right. Don’t forget that the first use of the steam engine was to remove water from coal mines in order to extract more coal. The reality of our time is that we have been living on a real explosion of cheap energy in the form of fossil fuel. This in turn allowed the explosion in information technology, with the added benefit of moore’s law. But the truth is that we are now around the maximum of the first explosion, and even more amazing is the fact that so few people are aware of it, together with the fact that there is absolutely no solution in sight for the energy aspect if you dive a bit in the numbers and quantity aspects. (from David MacKay, Cambridge professor, better take the full pdf). In other words, survival aspects are coming back with a vengeance, and not in ten years, already the case. Still not convinced that innovation has anything to do with “government”, as government is made up of individuals and groups with their own agendas. Was Ptolemy federally-funded?? Malcom McLean invented the shipping container that made modern shipping possible (and was forced by federal regulations to sell his trucking business if he wanted to operate a sea shipping business). Mail couriers existed before any federal postal system was created, though I will concede that mail was primarily set up by governments throughout history in order to distribute their decrees and consolidate their authority (Roman Mail, for example, was created for official correspondence only). GMT was brought into being by the Great Western Railway in order to standardize railway timetables (and later appropriated by the British government). Rural telephone & electricity networks, at least in the USA, were being developed long before the alphabet soup of federal agencies in the 30’s took over. The Niagara Falls Hydraulic Power & Manufacturing Company (a private firm) built one of the first hydroelectric dams in the Americas (and many others were created by private investors). Eventually the federal government took over (innovation or appropriation)? I can continue. My point is that in a great many cases, innovation proceeds with or without government intervention, and government retards it as often as it promotes it. And even when the government does build something, it is not done “for the common good”, but for a group of interests that wish to see it done. The history of Railroads in the USA are a prime example of government-sponsored crony capitalism, see Richard White’s excellent history, Railroaded. I guess the fundamental question that needs to be answered is “From where does ‘innovation’ come?” I’m not convinced that we’ll ever agree on an answer to this. Nate-your analysis is empirically unjustified. Postal technology (roads, offices, congressional franking, newspaper exchanges, the cross subsidy of letter postage in support of low-cost and delivery of printed matter, etc. ), expansion of telegraphy,… were a result of governmental initiatives. Where the “free market” played any role was in the venal exploitation of government to serve private accumulation. I also wanted to point out what I think is a possible error in the expropriation of Maslow’s hierarchy. The money and reputation aspects of social networking are “rewards” internalized by a very small number of people, as we know. The error I think is that, unless you gratuitously include entertainment and FIRE as “technologies of self,” the contribution of such technologies to overall GDP is extremely small. Man, this thread deserves more steam. I have been considering your ideas about Maslow, and I inevitably return in my thoughts to buddhist doctrine about the Eight Universal Sufferings. The original four were the sufferings of birth, aging, sickness and death. Then four more were added: having to part from loved ones, having to meet people you hate, being unable to attain one’s desires, and suffering arising from the five components of life (form, perception, conception, volition, and consciousness). Some of these are afflictions of the physical body, but still resonate with one’s spiritual condition. But some of those sufferings are social conditions (people we love or hate) and some are just plain delusions caused by our inability to correctly comprehend our conditions. Many of our technological innovations are attempts to defeat these sufferings, which will never be completely defeated, unless humanity becomes something else entirely. Human beings will always be born, age, get sick, and die, and during their life they will create suffering for themselves and others. So IMHO your question really is, are innovations leading us to enlightenment, or are they just another way to delude ourselves that we are not suffering? Man you guys don’t even mention agriculture. GMO’s are the greatest invention since the mule was sidelined. Yields in the last 15 years have doubled, with the use of less pesticides and herbicides. Don’t talk with your mouth full. I guess I would generally agree with your thesis here, except that I wouldn’t necessarily classify the endpoint as “decadence,” at least not with the traditionally pejorative connotations. In the grand scheme of things, I’d submit that there’s a lot of value in learning how to manage and operate the self, inasmuch as societies are composed of millions of individual selves, and I think a lot of our big problems stem from a gaping lack of self-awareness and self-composure on most of our parts. Beyond that, I think there’s a great deal of value in our growing capacity for self-expression, in that with, say, Twitter, millions of “ordinary” people from all manner of backgrounds suddenly have a chance to share and hear thoughts and experiences. If humanity is gradually evolving into anything like a Teilhardian supraorganism, or even if it’s not, it seems like there needs to be some time for individuals to focus on learning who and what they are; and I’d like to hope that that sort of thoughtful independence is a stepping-stone to larger and more thoughtful interdependence. For a narrative that sheds further light on your thesis you might also revisit David Nye’s _The American Technological Sublime_. The book mainly traces a shift from Americans seeking sublime experiences through nature to ones where Americans seek them through communion with grand technological achievements like the Hoover Dam or the Golden Gate Bridge. However, in one of the closing chapters titled “The Consumer Sublime” he posits that these sorts of innovations no longer engage us or evoke sublimity and that what enthralls us now are interactions with more consumer oriented technologies. The book was published in the early 90s predating most of the digital gadgetry you dwell on in The Shallows or The Glass Cage. But it anticipates some of what you seem to be exploring here. I agree with your general scheme in the rough. I am not sure about the labels for each level, but the trajectory is correct. We are moving from a base material survival to an intangible self-actualization, and our technology reflects this. 1) The apparent stagnation of the physical. In 200 years cities will look mostly like they do now, because the industrial revolution is done, and most of the revolution in the infrastructure has already happened. All the revolutionary change ahead is in the intangible realms of identity, society and self. But besides your pyramid, there is also Stewart Brand’s pace layers, where the bottom survival layers of tech evolve much slower. Changing the energy system will take longer, no matter when you do it. 2) Change in the higher dematerial realms will be anything but stagnant, and the most common complaint will be a wish it would slow down. 3) The reason technical leapfrogging doesn’t work is that you can not dwell at the “upper” levels without resting upon a working base of the lower. The pyramid needs solid foundations. A light nimble world of iPhones and apps won’t last long if there are no roads, clean running water, or toilets. 4) Figuring out who you want to be is just as difficult and challenging as figuring out how to survive. Maybe more so. As you climb up the pyramid it gets more difficult to level up. The total number of man-hours need to make a significant discovery increases as you go up. This extra effort is confused for stagnation. 5) It is important to remember that we don’t leave behind the lowers levels; they continue to grow and develop, and are in fact continually needed to support the higher levels. This is an additive structure, not a journey where we leave the survival modes behind. But certainly you can ask of each type of technology in the base layer and wonder: where does it go as it becomes more immaterial, intangible and spiritual? I agree with the pyramid to a large extent. I also think it brings up an important corollary issue, and that is whether technology is a net creator or net destroyer of jobs. Back in the days of the Luddites, it was conventional wisdom that technology destroyed jobs. That view was later discredited as the second half of the 20th century saw great employment gains coincide with great technology gains. As a result, the pendulum swung to the belief that all technology actually creates jobs. Maybe neither view was completely accurate. 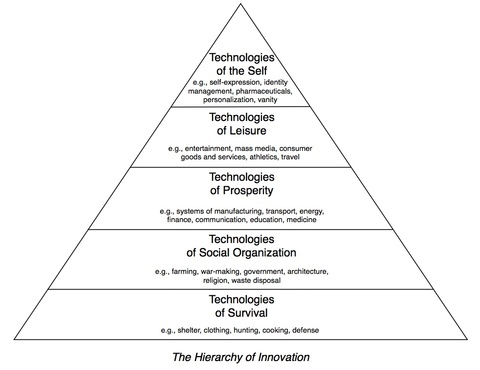 Maybe it depends on which level of your pyramid the technology addresses. If it is a “Technology of Prosperity”, it may create all kinds of ancillary benefits and drive additional needs that actually create jobs. Also a “Technology of Prosperity” adds wealth to the overall system, and that wealth can indirectly “pay” for the increased jobs. Conversely, if it is a “Technology of Leisure” or “Technology of Self” there are likely fewer ancillary benefits and needs created, and though there may be increases in consumer utility, there may not be a commensurate increase in actual wealth to fund increased employment. So, maybe the answer isn’t simply “technology destroys jobs” or “technology creates jobs”, but a more nuanced relationship that depends on the type of technological development.